Click on the links below to learn more about these great opportunities! Did you miss the application deadline for a program you are interested in? Call the program anyway to find out what opportunities might still be available. “Ready, Set, Kindergarten!” free reading program – Have fun at the library and help get your child ready for school! The Cortelyou Library (1305 Cortelyou Rd, Brooklyn) is hosting Ready, Set, Kindergarten! for children ages 3-5 and their caregivers. In this special six-session series, families enjoy stories & activities designed to encourage the development of early learning practices. Exploring literacy, science, & math through music, stories, art, & play will help you & your child get ready for school! Families will receive free materials to continue the learning and fun at home. Programs will be held on Saturdays at 11 a.m. on Oct. 13, 20 and 27, and Nov. 3, 10 and 17, 2018. For more information, visit bklynlibrary.org/first-five-years or call the Cortelyou Library at 718-693-7763. ADAPT Community Network Youth Programs: ADAPT Community Network, formerly United Cerebral Palsy of New York City, is the leading human service not-for-profit and a pioneer in providing cutting edge programs and services for people with disabilities. Every day, we build a more inclusive world for thousands of New Yorkers through education, technology, health, residential and recreational programs in all five boroughs. ADAPT’s commitment to Children’s Services includes comprehensive education for children and young adults. Our preschool, school age, and after school programs are specifically designed to engage and educate children with special needs. Our universal pre-kindergarten and integrated programs offer families a high-quality family friendly learning environment for children of all developmental levels. All classes are led by licensed and certified teachers and are staffed with certified teaching assistants. To learn more about our education programs, please visit https://www.adaptcommunitynetwork.org/service-options/education/ or call 877-827-2666. Afterschool Music & Technology Classes - The Bridge Multicultural Advocacy Project is offering afterschool music & technology classes for young people from October 1st – November 19th, 2018. Classes are held at the Bridge’s center at 1894 Flatbush Avenue, one block from Kings Highway. For more information, visit http://www.thebridgemcp.com/after-school/ or call 718.338.5200. Alternative Pathways to Graduate: If you are 15-21 years old and have fallen behind on credits or have dropped out of high school, it’s not too late to earn a high school diploma or GED. The Department of Education offers options to get you back on track to graduate and prepare for college and career success. For a comprehensive list of options in NYC, CLICK HERE. Aspirations Diploma Plus High School is accepting applications! DOE Aspirations Diploma Plus HS benefits over-aged (16.5 years or older) and under-credited (at least 8-10 credits) in many ways. Benefits include the opportunity to earn a minimum of 18 credits per year; sponsorship by an Advocate Counselor to ensure academic success; development of work experience through the Learn To Work internship program; preparation for the SAT and regent exams and for success in college and/or career by participating in College Access 4 All; the opportunity to participate in student leadership and PSAL basketball; support through The Child Center of NY and the Liberty Partnership Program of Medgar Evers College; as well as access to a state-of-the-art production studio for students who are interested in pursuing a career in music production and video production. If you are interested, please bring your latest transcript, RISA, Immunization record, birth certificate and 2 proofs of address. The program is located at 402 Eastern Parkway (@ Bedford Avenue). For more information, click here to see program flyer with information about interview dates and/or call W. E. B. Du Bois H. S. Parent Coordinator at (718) 773-7765. BCCP Afterschool Program: BCCP hosts a five-day per week middle school afterschool program for neighborhood youth at Brooklyn College. The program is offered Monday through Friday from 2:30 p.m.- 6 p.m. and includes a snack. Each day features workshop choices and activities that include visual and performing arts, design and technology, athletics, health and wellness, in addition to emerging technologies such as: 3D printing and fabrication, laser-cutting, coding and robotics. If you have any questions, please contact the BCCP Program Director at (718) 951-5015. Visit the website at www.thebccp.org. Boys Hope Girls Hope Scholars Program : Boys Hope Girls Hope (BHGH) scholars are enrolled in top-rated schools in safe neighborhoods, and painstakingly matched to the college preparatory curriculum best suited to their needs. BHGH scholars are matched with mentors who provide academic support, tutoring, and the positive role models so crucial to a child’s development and they participate in a full range of extracurricular activities, college-preparation exercises, and spiritual instruction and reflection along with receiving academic, financial, and spiritual support through college. To find out more, Click Here to visit the website or call 1-877-878-HOPE. Brooklyn College: At Brooklyn College, you’ll have access to a world-class education, award-winning faculty and state-of-the-art learning facilities — all at a very affordable tuition. Check with the campus admissions office to find out about events and activities offered for young people on campus all year long. To find out more, visit the website by Clicking Here or contact the Admissions Office at 718.951.5000. Brooklyn Educational Opportunity Center programs – Classes offered include: English as a Second Language, High School Equivalency, and College Prep courses, as well career development programs including Medical Assistant, Medical Billing and E-Records, Office Administration, Tourism and Hospitality Operations, and Security Guard Training. BEOC is a CUNY approved college prep program. All career programs lead to industry certifications. Job/Internship Placement assistance & Tutoring is available. It is never too late to start your career or earn your GED! Please visit the BEOC website at https://sites.google.com/site/beocadmissions11201/college-prep-only/programs to learn more about the application process. For more information on applying, and the schedule for enrollment, emailadmissions@beoc.cuny.edu or call 718-802-3330. Civil Air Patrol (CAP) – Floyd Bennett Composite Squadron – Young people (12-21 years) are invited to participate in the Civil Air Patrol program that teaches aerospace education, emergency services and leadership skills. More information is available on the CAP website: https://www.ny373.com/. For more information, call Deborah Peters, Deputy Commander for Seniors, Floyd Bennett Composite Squadron at (347) 661-2038. Clerical Skills Training & High School Equivalency Preparation - Are you 17-21 years old? Left High School early? Need a job? During this FREE 20-week training program you will receive: Business administrative/customer service skills, Public Speaking & Communications skills, College Access assistance, Job placement assistance, High School Equivalency (HSE) preparation & Preparation classes for two nationally recognized credentials: Microsoft Office Specialist & National Retail Federation Customer Service Certification. Opportunities for a Better Tomorrow (OBT) is an equal opportunity employer/program. Auxiliary aids and services are available upon request to individuals with disabilities. Program information as well as contact information for Brooklyn and Bronx OBT Training Centers is provided on this by clicking here to view the informational flyer. College Goal NY – FAFSA Completion Events are set to take place during the months of January and February 2019 in NYC to help college-bound students complete the most important tool in securing financial aid, the Free Application for Federal Student Aid — the FAFSA. A list of College Goal NY Event Locations, along with registration information and tips for completing the FAFSA, is posted at collegegoalny.org/event-locations. For a printable flyer with test locations, click here. The FAFSA completion events are scheduled in targeted areas throughout New York State that have a history of high financial need and where students submit a disproportionately small number of online FAFSA applications. At each completion event, students and families receive hands-on assistance with their online application and getting answers to questions specific to their circumstances. Participants can enter a drawing to win $500, provided through the College Access Challenge Grant (CACG), to help pay college costs. For more information, contact James F. Rodriguez, Retired Teacher at (866) 509-5921 or by email at jrodrig32@schools.nyc.gov. Community Links – Community Links is a Supported Education (SEd) service which assists individuals living with mental health conditions in pursuing educational goals and successfully completing TASC/GED, college, certification, licensing or vocational degrees. Community Links supports participants in realizing their full potential through educational achievements which promote independence and improve long-term work opportunities. Click here to read program brochure. For more information, call 929-210-9810 or email Ms. Marina Landman at mlandman@balticstreet.org or communitylinks@balticstreet.org. CUNY Fatherhood Academy @ Kingsborough Community College - The CUNY Fatherhood Academy is a FREE 16 week, 3 days per week program that can help you: Prepare for the TASC (formerly called the GED, NY’s high school equivalency exam,) Prepare for enrollment in college or a workforce training program, Learn about important topics related to parenthood, health and financial literacy, plus receive free Metrocards, Incentives & Food Coupons. To register for either program, but please fill out our Orientation Session Application and a representative will contact you to provide additional information about the program, assess your eligibility and register you for an upcoming session. For more information, visit the website at http://cewdkbcc.com/current-programs/cuny-fatherhood-academy/, email cewd@kbcc.cuny.edu or call 718.368.6784. CUNY Fatherhood Academy at LaGuardia Community College is an intensive 3-month (4-day a week) program sponsored by the NYC Young Men’s Initiative. We are recruiting fathers ages 18 – 28 needing a High School Equivalency Diploma (GED). We offer HSE test preparation, parenting workshops and financial support. We are recruiting for our College and Career Prep program for young fathers ages 18 – 30 who already have their GED/HSE or High School Diploma. We offer college and career readiness, parenting workshops and financial support. Our overall goal is to help fathers help themselves by obtaining the skills they need through education, employment and personal development to become self- sufficient and in turn accept the responsibility to remain or become part of their children’s lives. The program is holistic in nature and provides real opportunities for young fathers to become successful. Orientation sessions for both programs are held daily. Call 718-730-7336 for additional information. Click here to see program flyer. To enroll or for more information, click here to visit website. Dance Program for Ages 8-15 – Students are invited to apply for Dance Scholarships from Spoke the Hub Re:Creation Center (748 Union Street @ 6th Ave - Brooklyn.) Scholarships for the academic year 2018-2019 are available for General Study and the Young Artists Program at Spoke the Hub for ages 8 to 15 years old, with or without previous dance experience. Awards are based on financial need, passion and merit. Children of color are particularly encouraged to apply. Click Here to read a flyer about the program and Click Here for a scholarship application packet. For more information, call (718) 408-3234 or email spoke@spokethehub.org. 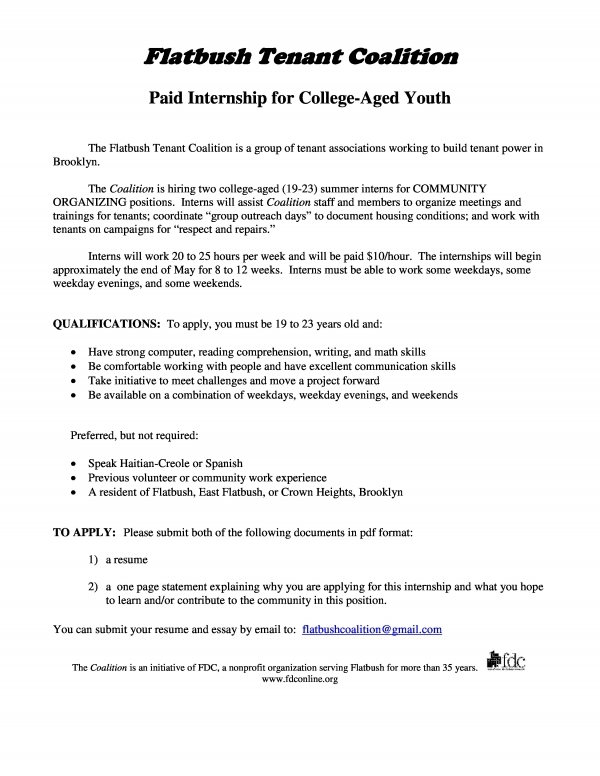 DYCD Programs – Do you need assistance finding a job or an internship? Looking for an after-school program in the community or a place to get some homework help? Are you looking for a social service program that offers support for families, immigrants, runaway and homeless youth or new fathers? The Department of Youth & Community Development (DYCD) offers all of these programs and more, including the summer employment guide for internship & program opportunities for youth ages 14-24 years old. Visit their website www.nyc.gov/dycd. Enter either your zip code or Brooklyn Community Board 14 into the search engine to find out about all the great programs and events available to you! Earn College Credits for Life Experience & Training – Prior-learning assessments (PLAs) award college credit, certification or advanced standing for a student’s non-academic experiences and training. Students that participate in PLA testing can use these credits as a shortcut to a college degree. Thousands of accredited U.S. colleges now recognize and grant credit for PLA’s. For more information about how you can earn college credits for previous work experience or other training, visit this website: www.bestcolleges.com/resources/college-credit-with-plas/ For more information, call (281) 846-3072 or email contact@bestcolleges.com. Earn your high school equivalency (HSE) & Career Training! Henry Street Settlement offers two different levels of HSE exam prep classes for students ages 18+, with free evening classes in all subjects (reading, reading comprehension, math, science, and social studies). Call 212-478-5400 to schedule the required assessment test. Visit the website at www.henrystreet.org/programs or email program officer Greg Rideout at grideout@henrystreet.org. Fedcap Pathways to Graduation – Fedcap offers a wide array of programs and services to help young people achieve success in education and employment and become happy and self-sufficient adults. Our specific focus areas include youth who have spent time in foster care or are “transitioning out” of other child-welfare and juvenile justice systems; those with physical, developmental or learning disabilities, and any young person “disconnected” from the support they need to move into a successful and self-sufficient adulthood. Fedcap offers support to complete high school, obtain a GED and a college education; assessment, vocational and soft-skills training, career advice and internships, and help finding and keeping sustainable employment, as well as extensive follow-up services to help individuals keep and advance in employment and explore future educational options. Each program participant is linked to a mentor who help students learn to make the best decisions and identify a network of adult “Life Coaches” who can share specific skills and expertise as well as critical business and personal contacts. Interested students should email youth@fedcap.org or jchambliss@fedcap.org or call 212.727.4370. More information is available online at http://www.fedcap.org/programs–education/youth-and-young-adult-services. Free After-school & Weekend Programs for Students of all ages! New York City offers children and teens a wide range of after-school and weekend activities–from paid internships to free academic and career-based programs. The hundreds of free programs are listed at https://insideschools.org/resources/free-programs are a great way to explore new interests, get extra support, and supplement what is being taught during the school day. For more information, contact info@insideschools.org. Free GED Classes – Free GED (HES = High School Equivalency) classes are being offered at two Brooklyn locations by COJO Flatbush in partnership with the Office of Councilmember Mathieu Eugene. 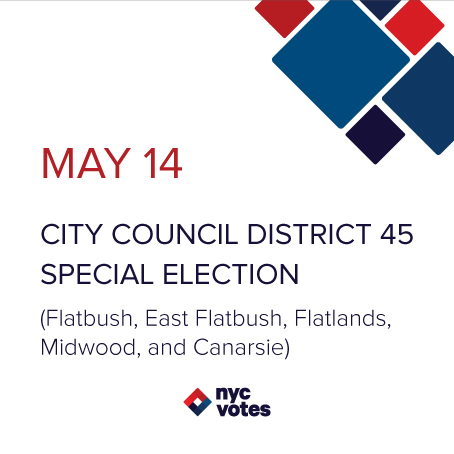 Classes are held at the Councilman’s District Office located at 900 Rogers Avenue, Brooklyn 11226 and also at the COJO office at 1523 Avenue M, 3rd Floor, Brooklyn 11230. A High School Equivalency Diploma will enable you to acquire new skills to succeed in the workplace, have access to better employment opportunities or help your children with their homework. Click here to see program flyer for 900 Rogers Ave classes or call 718-287-8762 or email CMEugeneEvents@gmail.com. Click here to see program flyer for 1523 Ave M classes or contact Jacob Hecht, Director of Adult education @ 718-377-2900 EXT 7637 or email JHecht@JewishCouncil.org. Free home internet for NYC Students from the Brooklyn Public Library! The Library Hot Spot Program is available for Eligible Students and their families. Get FREE WiFI at home , designed for students in grades K-12 who do not have internet access at home. Click here to View Program Flyer! Garden Apprentice Program (GAP) – Join Brooklyn Botanic Garden’s (BBG) garden-based, hands-on apprenticeship for students in grades 8-11. Work with other teens, build valuable job skills, learn about urban agriculture & the environment in one of the world’s most renowned public gardens. Acceptance in to the GAP program is competitive and requires a nine-month commitment, March – November. Applications are available by Clicking This Link or visiting the website at www.bbg.org/gap. For more information, email gap@bbg.org or call 718-623-7252. Girls Who Code Afterschool Programs – Girls Who Code (GWC) offers free after-school programs for 3rd – 5th and 6th – 12th grade girls to join our sisterhood of supportive peers and role models using computer science to change the world. This national nonprofit organization is working to close the gender gap in the technology and engineering sectors. GWC works to educate, inspire and equip high school girls with the skills and resources to pursue opportunities in computing fields. For more information, visit https://girlswhocode.com/clubs/ or email cchurch@bklynlibrary.org. Green Advanced Manufacturing Collaborative (GAMC) program at NYC College of Technology (City Tech), CUNY’s designated college of technology, offers stackable, credit-bearing industry-recognized credentials in Mechanical Engineering Technology and Industrial Design Technology. Wrap-around support services and job placement assistance are provided to program participants. Earn career-building college credits in advanced manufacturing free of charge. Eligible applicants must be 18 years old (preferably 24 or older), have a High School Diploma/GED or college credits, have US Citizenship or be legally authorized to work in the US and demonstrate strong math skills. For more information, visit http://www.citytechce.org/gamc-green-advanced-manufacturing-collaborative.html. To reserve a seat for an upcoming session,call 718 552 1150 or email gamc@citytech.cuny.edu. Health Professions Program at Columbia University - Columbia University Medical Center provides students interested in pursuing a career within the health professions with a well-defined, integrated approach to learning, focusing on the core science curriculum needed to apply to health professions schools for medicine, dentistry, nursing, public health, occupational therapy, physical therapy, and nutrition. Students engage in intense coursework, labs, learning-skills, and career development courses during the six weeks of the program while participating in practical experiences and seminars. The summer program will take place June-July 2019 and will offer students the opportunity to enhance and improve their chances of becoming successful applicants and students at the health professions school of their choice. Round-trip travel fees, all food, housing, and a stipend is offered to all participants. Apply early! Click here to view program website. For more information, contact Cindy Estevez, MPA at (212) 305-4157 or email shpep-ps@columbia.edu. Italian American Civil Rights League Youth Programs: IACRL’s youth programs are organized into departments of youth community employment and development. The organization’s mission is to enhance the services of youth and families in the community and to promote neighborhood harmony, stability and quality of life. Current programs include: COMPASS NYC, Summer Youth Employment Program (SYEP), Work, Learn & Grow Employment Program (WLG) & the Out of School Youth Program (OSY). For more information about these programs and other opportunities available at IARCL, visit https://www.italianamericanleaguenyc.org/programs or call (718) 642-2180. Ladders for Leaders is a nationally recognized DYCD program that offers high school and college students the opportunity to participate in paid professional summer internships with leading corporations, non-profit organizations and government agencies in New York City. Ladders for Leaders gives students a unique opportunity to explore their interests and discover new ones through: Pre-employment Training: Receive help with résumé and cover letter writing, and interviewing skills. Learn essential workplace readiness skills and business etiquette; Paid Summer Internships: Paid internship opportunities available in a variety of industries to accommodate student interests; Opportunity to join a growing Alumni Network: Broad network of alumni, post-internship opportunities and networking events open only to past participants of the program. This competitive process differs from the Summer Youth Employment Program in that it requires applicants to submit an application to one of several community-based organizations serving the five boroughs. Applications are evaluated based on academic performance, response to an essay question and résumé. For more information, please contact 1-800-246-4646 or apply online now. New York City Teaching Fellows program prepares exceptional teachers committed to a better future for the NYC students who need them most. Since 2000, the Fellows program has provided New York City students with thousands of talented new teachers. Today, Fellows work in 80 percent of New York City’s 1,800 public schools and represent 12 percent of the city’s active teaching force. The application is available at this link – https://nyctf.teachertrack2.org/r/17fea2b0-d749-4d89-93fd-a50e01606c62. For more, click to visit website or contact Julia Zweig, NYC Teaching Fellows Site Manager at Jzweig3@schools.nyc.gov. New York State Offers College Support: Start your plan to get to college NOW. The earlier you start planning for college, the more prepared you’ll be. The NYS Higher Education Services Corporation provides information and resources for college students preparing for college, securing funding and repaying education loans. For more information, visit www.hesc.ny.gov. NPower Program: NPower creates pathways to economic prosperity by launching digital careers for military veterans and young adults from underserved communities in Harlem and Brooklyn. The Technology Service Corps program features a 15-week, intensive hands- on training, where students are placed into internships with top corporations and nonprofits when they complete the program. NPower also offers cybersecurity and cloud computing programs. For more info, visit: http://npower.org/ or call 212.564.7010. Parks Department Teen Programs – New York City’s Parks Department offers many educational & tutoring programs for students of all ages. Programs include RECYouth, a digital media program, Garden Kitchen Lab, a food science program, Green Teens, an environmental education program, as well as Sports programs, and educational, fun afterschool programming. Programs are available at recreation centers in all five boroughs. For more information, visit https://www.nycgovparks.org/programs/recreation/teens or contact Erica Serrano at (212) 255-3705. SAT Preparation (Free, Online) – The ACS Office of Education Support and Policy Planning would like to inform all staff about FREE SAT prep opportunity. Khan Academy partnered with College Board to provide online, FREE SAT prep. Khan Academy is designed to engage students in 30 minutes of productive practice on a daily basis. Students need to create a Khan Academy account at https://www.khanacademy.org/sat is reminding all education specialists, parents, and guardians to make sure your students know to start studying for the SAT now. For more info, click the following links: Official SAT Practice with Khan Academy Linking Flyer (Steps to Link) & Official SAT Practice with Khan Academy Overview Flyer. Saturday Art School - Pratt Institute’s Saturday Art School is open to children and teens ages 6-18 interested in exploring a variety of media, techniques, and approaches. Saturday Art School is a teaching and learning laboratory where most classes are taught by art and design education students who are supervised by faculty. Classes meet from 10am-12pm and take place on the Pratt Institute Brooklyn campus located at 200 Willoughby Avenue, Brooklyn, NY, 11205. Scholarships and financial aid opportunities are available. Please call Wendy Margulies at 718-636-3654 for information about eligibility and how to register. Visit the Saturday Art School website at www.pratt.edu/saturday-art-school/ for more information. School of Cooperative Technical Education (Coop Tech) is accepting Applications! The School of Cooperative Technical Education is a half-day vocational program that offers students hands on training in a variety of in demand and cutting edge trade areas. Coop Tech serves approximately 1,500 students who are 17 to 21 years of age and who represent a wide variety of ethic and cultural backgrounds, disabilities and educational histories. Coop Tech students join us as either shared instruction students who also attend over 130 traditional high schools and Pathways to Graduation programs or as post-graduates who have already obtained a diploma. Enrolled Co-op Tech students take part in the Department of Education’s Work Based Learning (WBL) Program and are matched with an internship partner. Some internships are paid. Classes are offered in all five boroughs. For more information, visit Coop Tech’s website at www.co-optech.org or call the Brooklyn campus at (718) 222-6600. Tech Industry Opportunities & Career Development Resources for Young Women – Despite the wide range of job opportunities in computer science, women remain significantly underrepresented in the field. Today, however, many companies, organizations, and colleges are committed to increasing the number of women in computer science. Visit https://www.computerscienceonline.org/cs-programs-for-women/ to read more about what’s being done and how young women can prepare for a successful career in this innovative field. Scroll down the page to find out about free programs, scholarships & other resources available to young women interested in pursuing a degree in the tech industry. Teen Reviewers and Critics Program (TRaC) is a free 10-week afterschool program for high school students from all over New York and New Jersey to explore the arts in NYC while expanding critical thinking and writing skills. Participating teens are placed in one of six groups—film, dance, theater, visual art, music, or multi-arts—to dig deep into a specific artistic genre by attending cutting-edge performances, meeting artists, visiting museums, learning to navigate the city, and much more. The Fall 2018 application deadline is Sunday, August 12, 2018. Please visit https://teens.artsconnection.org for more information or to apply, or contact Kristina Gonzalez at GonzalezK@artsconnection.org. Year Up program - Year Up enables young adults to move from minimum wage to meaningful careers in just one year. Year Up connects young adults who need opportunity with companies who need their talent. Highly motivated young adults spend six months in the classroom learning the skills employers are looking for, including soft skills as well as six months with a partner company, applying new skills and gaining critical work experience. Year Up’s results speak to the success of the program. Over 90% of Year Up graduates are employed and/or enrolled in postsecondary education within four months of completing the program. For more information about the program, visit https://www.yearup.org/future-students/?location=new-york/ or call (212) 785-3340. YSA Youth Project Grants Available for Students! Want to make a difference? Take action? Solve a tough community problem? Whether you’re a child, teen, educator, or adult champion, YSA Grants can power your service and service-learning projects year-round. Why grants? YSA believes in investing in youth as problem solvers to address the most important challenges facing our world. This bold strategy put children and youth in the driver’s seat and gives them the power to plan, implement, and witness the full impact of their service. YSA know that youth bring new strategies, skills and initiative to solve the world’s most challenging issues. YSA Grants can help. Click this link to check out YSA Grants & those offered by partnering organizations for Youth committed to making a positive difference in the world. For more information, call 202-296-2992 or email outreach@YSA.org. Money is available to help you fund your college education! The problem is where to start your search. We recommend checking directly with the schools that you are planning to apply to or are currently enrolled in. Then check out the scholarship listings below and don’t forget to check sites like www.fastweb.com or www.finaid.org . College and high school guidance counselors, local librarians, your elected officials, the NYC Department of Youth & Community Development and your local chamber of commerce are all resources that can provide more information about available scholarships that you might qualify for. “Immigrants Rising” Scholarship Guide – Click here to view an undergraduate scholarship guide for the 2018–2019 school year. This directory provides a list of hundreds of national scholarships that don’t require proof of citizenship or legal permanent residency to apply for. Click here to view the Immigrants Rising directory. B’nai B’rith International Diverse Minds Writing Challenge – The Diverse Minds Writing Challenge is a scholarship competition that asks high school students to write and illustrate a children’s book that tells a story of tolerance, diversity, or inclusion. Students currently enrolled in grades 9-12 and residing in New York City are eligible to participate. The first place individual or team will receive a college scholarship of $5,000 and B’nai B’rith will professionally publish their submission. Second and third place winners will also receive scholarships. The teacher of the student(s) who places first will receive a $1,000 stipend, and the school will receive a $500 grant. Visit the B’nai B’rith website at http://www.bnaibrith.org/diverse-minds.html or contact Laura Jeser at diverseminds@bnaibrith.org. The 2018 deadline is August 24, 2018. Blacks at Microsoft (BAM) Scholarships - Dedicated to supporting the continued growth and development of black employees at Microsoft Corporation, BAM will award two $5,000 scholarships to outstanding high-school seniors who are interested in pursuing careers in technology. The scholarships are renewable, so winners who continue to meet the criteria can receive an annual $5,000 award for up to four years. Applicants must be a high-school senior of African descent (for example, African-American, African, or Ethiopian) with a 3.3 or higher GPA and plans to attend a four-year college or university in the fall of the year following high-school graduation to pursue a bachelor’s degree in engineering, computer science, computer information systems, or select business programs (such as finance, business administration, or marketing.) For more information about this opportunity or to apply, please visit the https://www.microsoft.com/en-us/diversity/programs/blacks-scholarships.aspx before the deadline of March 8, 2019. College Match Program – The QuestBridge National College Match is a college and scholarship application process that helps outstanding low-income high school seniors gain admission and full four-year scholarships to the nation’s most selective colleges. College Match Scholarships, which are provided by participating colleges, cover the full cost of tuition, room and board, are loan-free, and require no parental contribution. If you are a student who has achieved academic excellence in the face of economic challenges, you are encouraged to apply. QuestBridge’s college partners are committed to making college affordable for all students—regardless of financial background —and offer generous financial aid packages that cover 100 percent of demonstrated financial need. A typical QuestBridge College Match Scholarship package usually covers the full cost of tuition, which is usually $40,000 (depending on the college) and the full cost of room and board, which is usually $15,000 (depending on the college). To learn more, visit www.questbridge.org. The deadline is September 27, 2018. Computer Science Scholarships – Enhanced education funding opportunities from public and private institutions for Computer Science education has increased, reflecting the great demand for new talent in the field of computer science, and scholarships for computer science majors are now more prevalent than ever. With over 600,000 tech-related jobs going unfulfilled in the past year and with 51% of STEM jobs projected to be related to computer science by 2018, the time is ripe for student recruitment in this field. Visit https://www.bestcolleges.com/financial-aid/computer-science-scholarships/ for a list of over 40 scholarships and grants available for computer science majors. CUNY StudentsFirst Rewards Program: CUNY students can earn points by CUNYAC Championship games. Points are totaled following the end of the semester and winners receive incredible prizes. The GRAND PRIZE is FREE TUITION FOR A YEAR! (The amount awarded will be based on undergraduate tuition for a year – $6,530 for Four-Year students and $4,800 for Community College students.) Any current CUNY student can participate in the program. For more information, visit http://www.cunyathletics.com/sports/2013/4/3/studentsfirstrewards.aspx Click here for the CUNYAC sports schedule for the 2018-19 school year. Dell Scholars Program: The Dell Scholars Program is more than just a scholarship. Sign up for the opportunity to be a Dell Scholar to receive academic, social & financial support as you prepare for, enroll in and complete your college education. More information is available at www.dellscholars.org/scholarship This year’s scholarship application will be available on October 1, 2018. The submission deadline is December 1, 2018. Explore the World Scholarship Committee – Hostelling International-NYC offers the opportunity for a $2,000 scholarship to help finance an international trip that includes an educational or service component. The scholarship is available to 18-30 year-olds who demonstrate financial need and live within the five boroughs. For more information, please visit the website at www.hiusa.org/programs/travel-scholarships/explore-the-world. Sign up today to receive early notification about the 2019 scholarship application. Future Innovator Scholarship: This is a $2,000 scholarship to be awarded to one student who exhibits leadership skills and who demonstrates our core values: Be a Knight, Make an Impact, and Succeed Together. For full information and to apply, applicants can visit: https://studysoup.com/scholarship Deadline to apply: August 15, 2018. Hispanic Scholarship Fund General College Scholarships: The HSF Scholarship is designed to assist students of Hispanic heritage obtain a college degree. Scholarships are available, on a competitive basis, to high school seniors through graduate students in all fields. Merit-based awards range from $500 to $5,000, based on relative need. To learn more and to apply, visit hsf.net/en/scholarships/programs/general-college-scholarships The 2018 scholarship application will be available on December 31, 2108. The submission deadline will be April 2, 2019. Horatio Alger New York Scholarship - The Horatio Alger New York Scholarship Program provides financial assistance to students in the State of New York who have exhibited integrity and perseverance in overcoming personal adversity and who aspire to pursue higher education. The applicant must have a strong commitment to pursue a bachelor’s degree at an accredited institution. The student may begin his/her studies at a two-year institution and then transfer to a four-year institution. The applicant must also plan to enter college no later than the fall following high school graduation. Each applicant must demonstrate involvement in co-curricular and community activities. The total value of this award is $7,000 paid out in installments annually. Apply at https://scholars.horatioalger.org/scholarships/ by 5:00 p.m. Eastern Time on October 25, 2018. I Love My School Scholarship – Abodo.com is offering two $1000 scholarships per year to the students who write the best short essay (max. 1000 words) about what makes your school, campus and surrounding neighborhoods so awesome. Include a few pictures for bonus points. Submit your essay along with links to any photos you’d like to submit in the form above. We’ll be announcing the winner on Facebook and Twitter. The annual deadlines are October 31, 2018 & February 28, 2019. National High School Essay Contest: This is the 20th year of this prestigious contest, which encourages high school students to think about important international issues and learn about the United States Foreign Service. Eligibility for AFSA’s 2017 National High School Essay Contest is open to students in grades nine through twelve. The 2018 essay prompt will be released in September 2018. Please contact Perri Green, AFSA’s Awards Coordinator, at green@afsa.org with questions. For more information and to apply, visit afsa.org/essay-contest for additional details about the scholarship and essay topic. Undocumented Student Scholarships – If you are an undocumented student struggling with tuition costs, lack of access to federal financial aid and varying state laws that prohibit undocumented community members to pay in-state tuition or attend at all, help is available. Schools across the country, private entities, and organizations continue to invest in students and have helped countless students go to college by supporting scholarship funds. Visit http://genprogress.org/about/scholarships-for-undocumented-students-2/ for a list of scholarships that have an upcoming deadline and are open to undocumented students. For more information, contact Mayu Takeda at mtakeda@americanprogress.org, or Laura Bohorquez at laura@unitedwedream.org. Voice of Democracy Scholarship: The Voice of Democracy Scholarship Competition is an annual national audio essay contest for high school students (grades 9-12) designed to foster patriotism by giving students the opportunity to voice their opinions about their personal obligations as Americans, and address their responsibilities to our country. This year’s theme is “Why My Vote Matters,” Applicants must win at the local level to advance to the district and state levels. Each department’s first-place winner receives an all-expense-paid trip to Washington, D.C., plus the opportunity to compete for the national scholarship. The amount of each award varies annually. The first-place national award winner receives $30,000. Prospective applicants must apply by October, 31, 2018 at https://www.vfw.org/community/youth-and-education/youth-scholarships or call (518) 463-7427 for more information. Women in Technology Scholarship: This is a $1,000 scholarship to women seeking a career in computer science and/or computer programming, a field they are highly underrepresented in. The scholarship will be awarded to a female student who demonstrates a passion for computer science and is actively seeking opportunities for a meaningful career in the industry. For full information and to apply, applicants can visit: https://studysoup.com/women-in-technology-scholarship Deadline to apply: September 14, 2018. Zumper Brooklyn Scholarship – Real estate agency Zumper is offering $1,000 scholarships for Fall & Spring semesters for winning students to put toward tuition, books, or whatever else you need to get you through school. Zumper is looking for outstanding students who have helped their classmates or community in a tremendous way. High school and college students are eligible to apply. The application consists of a 500 word essay on the topic posted at https://www.zumper.com/scholarship. For more information, contact Julie Aielllo at julie.aiello@zumper.com. The 2018-19 academic year deadlines are November 15, 2018 & April 1, 2019.